This time, to keep the focus on the mediation analysis I will skip reading-in the data and generate a synthetic dataset instead. This is because otherwise I would have to spend the next paragraph explaining the dataset and the variables it contains and I really want to only focus on the analysis. There are two ways to test the null hypothesis that the indirect effect are equal to each other. The first is to specify a contrast for the two indirect effects. In the definition of the contrast the two indirect effects are subtracted. If it is significant the two indirect effects differ. The second option to determine whether the indirect effects differ is to set a constrain in the model specifying the two indirect effect to be equal. In my case the test is not significant so there is no evidence that the indirect effects are different. NOTE that bootstrapLavaan will re-compute the bootstrap samples requiring to wait as long as it took the sem function to run if called with the bootstrap option. Since this post is longer than I wanted it to be, I will leave as a brief introduction to mediation with lavaan. In this follow up post I describe multiple mediation with lavaan using an actual dataset. And if you might be interested in how to automate the plotting of lavaan’s output into a pretty graph read this post. On github is the whole code in one .R file. Your blog is super helpful, thank you for the contents. Could you explain a little bit more why a one must add the covariance between the two moderators (M1 ~~ M2)? Could you suggest a paper that explores this? Thank you. Hi Patricia, I do not know of a paper exploring this topic in specific. Preacher and Hayes (2008) talk about this briefly, maybe you can find more references in their paper. That is also the paper I used to translate the mPlus formula to lavaan, see the `with’ clause in the mplus statements in appendix A. Thanks, the paper solves my question! Is the same approach feasible with three mediators? Yes it is. You will have to extend the model to accommodate for a third mediator. Starting from modeling the mediator itself, adding indirect and total effects plus modeling the covariances of the 3 mediators which would be m1~~m2, m1~~m3 and m2~~m3. I suggest you then check with semPlot whether you created all the paths… Goodluck! Thanks for you help. I did what you recommended to do and it worked. Now, I’m little bit confused. For practicing, I changed the order of the two mediators in your example and I noticed that the “total effect” is not the same. Is there a reason for that? I get the exact same indirect and total effects for both models. If you like you could mail me your model specification [varati at hotmail dot com] and I can see whether I figure out what is different between our approaches. By the way. Your comment point out to me that I made a mistake in the specification of the total effect which I did not spot before. Thank you very much for sending me into the right direction! If you try the proper formula the total effects are identical. The reason why it happened is that, the wrong formula was using the first mediator for both estimates. Therefore, inverting the order of the mediators yielded different estimates. Thanks a lot. Now everything is ok.
I’m not using R for a long time, so this could be a beginner’s question. Thank you for posting this! It is really helpful. Thank you so much for your easy to follow directions and code. Thank you, this is such a clear, concise, and informative article with an elegant set of solutions and helpful links for further information! Your multiple mediator model example seems to be just identified (has 0 degrees of freedom) and thus does not estimate model fit. The same happens with my own two mediator model, which is essentially identical but has a few control variables added. I could live with this, if I knew it was a necessary property of multiple mediator models (with no latent variables). Unfortunately, I could not confirm this anywhere. Indeed, Appendix B in the above cited Preacher & Hayes 2008 paper has an SPSS output which provides fit statistics. So, I wonder if you could give me any pointers whether I should be worried about the lack of model fit statistics and more broadly, why some multiple mediator SEM models are just identified and others are not. Hi Alexander, thank you for the question, I think I could develop this into a follow up post. In the mean time I hope I can give you some elements to get going. I believe just identified models are not per se problematic, as far as the theory behind them is solid. About determining the goodness of fit of your model you can look at RMSEA, SRMR, and CFI (e.g. fitMeasures(mdlFit, “cfi”)). Engel, Moosbrugger and Muller (2003) give a nice primer (Evaluating fit of structural equation models…). Another paper I also like is ‘A Meditation on mediation’, it provides a way to estimate the effect size of the mediation effect. As an extension to that I also compute AIC of the given model, then invert the mediator with the independent variable and check how AIC and effect size of the mediation effect changes. This procedure might provide more insights just by comparing one model with another, but then again, when using numbers basically any test is possible, but it remains to establish whether the test itself makes sense. The bottom line for me is that the theory has to drive the testing. Therefore I prefer a model with a less nice fit but which provides a better understanding to a model with a very good fit but making the theoretical explanation more complex. Thanks for the reply! I’m looking forward to the new post! Just to clarify, what I was referring to is that your “multipleMediation” model from above and my own model both result in perfect fit(? ): CFI = TFI =1, RMSEA = SRMR = 0, p-value that RMSEA <= 0.05 is NA. It is true, your model estimates AIC & BIC (in my model, these are missing for whatever reason). Perhaps, I was wrong to assume that this is due to the model being just identified. I was mainly assuming this, because if the covariance of the two mediators is not estimated, the fit measures become more meaningful both in your example and in my own model. Disclaimer, I haven't yet looked into the papers you recommend. The paper won’t help you with the ‘perfect fit (? )’ issue I am afraid. I am not sure why AIC and BIC would not be estimated in your model, but I know there is a google group for sem and one for lavaan and maybe they will be able to provide more insight that I could? Thank you so much for this helpful post! Do I need to have multiple lines for the indirect and total effects? If you have semPlot installed try to plot the fit that you get from the sem() function to see determine whether you successfully represented all the path that you wanted to include in your analysis. Thanks for this really helpful post. 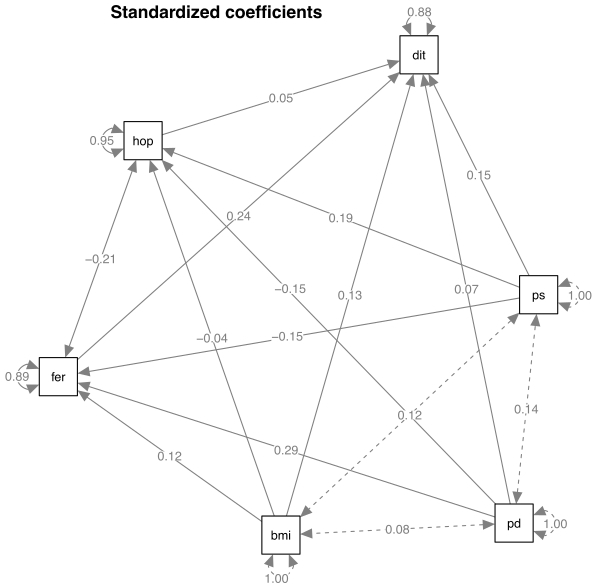 I have a question on why the effect sizes I obtain with lavaan might differ from those I obtain using cumulative link models (clm, r package: ordinal) , which yields standardized beta estimates for predictor variables. The thing I am confused about is that my predictor variable X has a large 'significant' beta coefficient when I run the full model using clm (r package: ordinal) – but when I look to see if X is mediated by M1 or M2 in package lavaan, the effect of X itself is no longer significant (i.e. the CI associated with the total effect include zero). I'm wondering if I am violating the assumptions of lavaan by fitting an ordered categorical response term as the DV (Y). Do you know? Thank you! I do not have experience with fitting ordered categorical variables in lavaan, my experience with lmer and glm says that they give an error if things do not make sense. I am not sure I am allowed to infer that everything is working fine if you did not get an error when you fitted your model, maybe asking to the lavaan google group whether lavaan handles ordered categorical response terms will provide you a better answer than mine. On the other hand, note that there is a bunch of people arguing that mediation does not require a significant total effect of X on Y (a list of references can be found in the Preacher and Hayes’ paper I cite above). Good luck! Thanks very much – helpful suggestions! Thank you so much for this series of posts on lavaan and multiple mediation. I am testing a model that has three mediators, one IV, and one DV (no controls). You suggested to a different commenter to use semPath to ensure that the model has been correctly identified. I followed this step but I’m still not positive my syntax is correct. Here is a link to what my plotted coefficients look like: https://ibb.co/k82mey. The mediators are FSO, SAB, and SRS. The predictor is MMS and the outcome is DVM. 2 – if you like to show if a specific indifrect effect through a mediator is larger than another you can contrast the mediators by subtracting the indirect effects from one another (e.g. SRS8MeanIDE – SABWMnIDE; SRS8MeanIDE – FSexO10MnIDE; SABWMnIDE – FSexO10MnIDE). HTH! Thank you very much for these suggestions! They are greatly appreciated. I tried to contrast the mediators but I didn’t see any results in the output. Here is my syntax. Can you spot what I might be doing wrong? Hi Lola, Do I understand correctly that you do not see the results with the name contrast1, 2 and 3 in the output of the calls to either summary or parameterEstimates? I tried to reproduce your error by fitting the model you describe above and applying the fit to a dataset after renaming some variables to your names, but I could not reproduce your problem. At the bottom of Defined Parameters, above ‘total’ I have the three contrasts. contrast1 := indirect1 – indirect2. Does this sort things out? That worked! It may be the version of lavaan that was the issue. Thank you very much. Finally, in your previous comment you suggested that I add the mediation effect size. I’m assuming that means that it’s not being captured in the sumIDE part of the syntax. What can I add to produce the effect size? Does that mean my c’ is NOT the coefficient next to sumIDE in the output? Hi Lola, nice that it worked. About the effect size of the meditation effect or ‘proportion of mediation’ (Iacobucci, Saldanha, Deng, 2007): it’s indeed not captured by the sumIDE, but it’s the ration between the sumIDE and your total effect. Rather than fitting the whole model with that formula included, you can also compute it in R taking the estimate of ‘sumIDE’ and dividing it by the estimate of ‘total’.